This interview by Zofeen Maqsood was first posted at the American Bazaar and is reprinted here with permission. Sadaf Jaffer (center) is being sworn in as the new mayor of Montgomery Township by New Jersey Attorney General Gurbir Grewal on January 3, 2019. 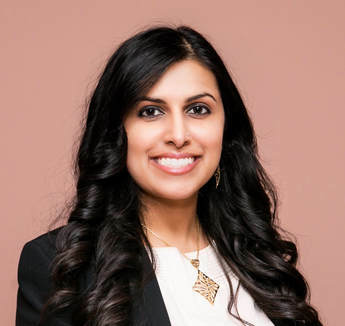 Sadaf Jaffer created history of sorts earlier this month when she took oath as the mayor of Montgomery Township in New Jersey on January 3. She was sworn into office by New Jersey Attorney General Gurbir Grewal. She is the first-ever South Asian woman and the first Muslim to serve as a mayor in New Jersey. Jaffer is a post-doctoral research associate in South Asian studies at Princeton University, where she teaches South Asian, Islamic and Asian-American studies. An early advocate of anti-bias and community building work in Montgomery, NJ, the new mayor talked with the American Bazaar about everything from her Pakistani roots to writing a book on Ismat Chugtai. In these times of anti-immigrant rhetoric, how significant it is to be sworn in as the first South Asian American woman mayor in New Jersey? Representation matters. When I was first running for office someone asked me why we didn’t see more South Asian Americans involved in the political system when the population of South Asians in our community is relatively high. I replied that if people never see anyone who looks like them in the spaces where political decisions are made, they may think it isn’t the place for them. It’s important for there to be a first, so there can also be a second and a third, etc. A few years ago, I started working with a small group of women in New Jersey to start an organization. We decided to call it Inspiring South Asian American Women (ISAAW) to encourage more South Asian American women to get involved in the political process. In my difficult moments, I know I can reach out to my ISAAW sisters. In times of celebration, they are always there for me. We have a need for mentorship and networking among women to make sure that we have the representation in government that we deserve. Would you say, post the 2018 mid-terms, the United States is actually seeing how powerful women and particularly immigrant women can be? What do you think brought about this change? Immigrant communities are often focused on establishing themselves politically and not wanting to rock the boat. I would say that second generation immigrants see themselves as full members of the US society and thus are more willing to put themselves out there. I also think that the 2016 election was a wake-up call that no one is coming to save us. We have to save ourselves. We must also keep in mind that there have always been very powerful women. I’m currently writing a book about such a woman (Ismat Chughtai), who was an Indian Muslim writer and intellectual. We stand on the shoulders of those feminist activists who came before us. What do you think that some get wrong about immigrants and immigration? Can it be the lack of cultural understanding? Anti-immigrant sentiment is something that must be whipped up, because on some level most Americans understand that their ancestors migrated from elsewhere in the world. I find that many Americans are simply not aware of how immigration works in the contemporary context or indeed the racist history of the immigration regime in American history where white immigrants were given much more preference and rights.
" It is imperative that we come together to fight all forms of bias, discrimination and hate. Anti-immigrant sentiment is directly connected to other forms of bias and discrimination. We have to work together to fight what ails our society." I also think that it’s easy to hate what we don’t understand. It is for this reason that I’ve dedicated myself to community building in my town. There was an anti-Muslim bias crime early on in my first year on the Township Committee and I responded by starting an anti-prejudice and community building group called Montgomery Mosaic. It is imperative that we come together to fight all forms of bias, discrimination and hate. Anti-immigrant sentiment is directly connected to other forms of bias and discrimination. We have to work together to fight what ails our society. What are your immediate concerns in your locality and how do you plan to expand on diversity? My main concern is civic engagement and education. I want community members to know that the government is meant to serve them and that they are welcome to express their concerns at any time. I plan to pursue Gold Star Status through the national Not In Our Town anti-prejudice organization. I plan to continue the monthly community building events I’ve been organizing for the past year. I also aim to get diverse voices on boards or commissions. For example, our Planning Board had no women on it so I made sure to change that this year. Did you have any South Asian women role models growing up? My immediate role model was my mother. She pursued her career interests and is really a force of nature. When I started studying Islamic history and South Asian history I became completely obsessed with the Urdu writer Ismat Chughtai, who is perhaps most famous for her 1946 obscenity trial for the short story “The Quilt” because of its discussion of a sexual relationship between two women. Whenever I feel hesitant I remind myself of what Ismat Chughtai was able to do in her lifetime and I feel empowered and emboldened. You were born and brought up in the United States. Tell us about your roots in Pakistan and also the time you spent in India. Did it shape any of your views or influence you in any way? My mom was born in Pakistan and my dad was born in Aden, which used to be a British colony. We used to go to Pakistan almost every year as a child and I think that gave me a truly global perspective on how subjective so many things in our lives are. Most of our lives are shaped simply by where we are born and our family circumstances. I think that also made me want to learn more about other cultures and understand differences while also finding commonalities. After my undergraduate degree, I moved to India for two years to study Urdu language at the American Institute of Indian Studies Urdu Language Program though fellowship from UC-Berkley. This sustained time in India was really invaluable for me and as you can imagine I experienced severe reverse culture shock once I moved back. As my dissertation research was on Ismat Chughtai. I have spent a lot of time on research trips in Delhi and Bombay. I draw a lot of inspiration from the way in which diverse communities coexisted in South Asia and I see that as a model.